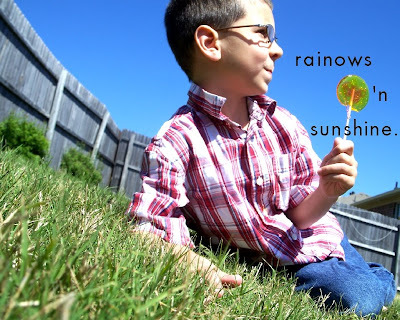 little momma and company: making rainbows. It's been rainy and cloudy! I need a little color. I can't get these off of my mind! As soon as the humidity goes down, I am going to whip out a batch of these! They are great enjoyed outside. The perfect addition to a sunny day. Lightly spray a cookie sheet with pam, or lightly oil. Place lollipop sticks in rows leaving 2 inches of space in between.Combine sugar, syrup, and water in a large saucepan. Bring to a boil over high heat. Without stirring, cook until mixture reaches 305 degrees. Set up an ice bath in the sink. When the mixture is done, dip the bottom of the saucepan into the ice bath for 10 seconds to stop cooking process. Stir in extract. Divide sugar mixture into 3 separate bowls. 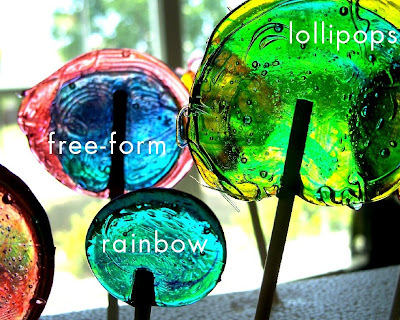 Color one bowl with the red food coloring, one with the yellow, and one with the blue.Spoon the mixture over the lollipop sticks, creating free form designs by mixing colors. Let harden and enjoy. holy cow!!! YUM!! i can't wait to make those!! Girl. You never cease to amaze me. those are so pretty!!! it's great to have you blogging again! :) have you ever used a flavor other than the orange? I swear we have parallel lives. We made lollies a few weeks ago. So fun! Reminds me of stained glass.....what a fun mom you truly are.....! All these colors make me so happy. I hope you have been doing well. This is a little bit freaky....I guess Katiehojo and I are on the same wavelengths today....I was hoping for your dutch baby recipe too!!!!! I googled it...but I googled "doughboy"...NOT the same thing :( Then, I read Katie's comment and googled dutch baby and I think I found it on Cooks.com??? I'm gonna give it a try. I have high hopes...the one I made with your recipe was super-duper!!!! I love them! 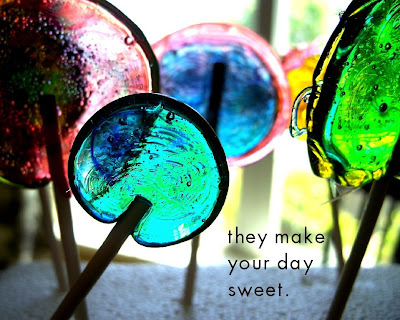 I am going to feature them tomorrow when I do my crafty round up post. Love it! Can't wait to try it out. Making this my weddin favour! Thank you so much!! This is adorable! 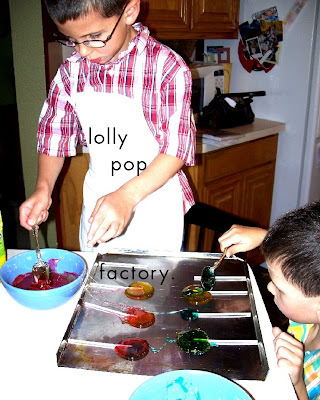 I am studying solids and liquids with my firsties this week and plan on making these! 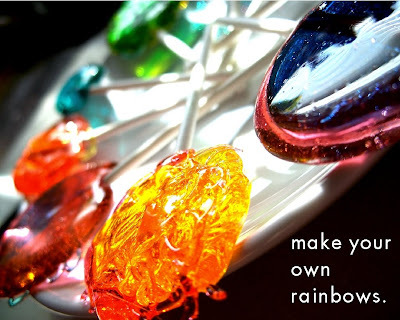 Just wondering... how many lollies did this recipe make?